Have the Mental Training for Mountaineering Adventures. You have decided to climb a mountain, trek in a wilderness environment, go to altitude and step outside your comfort zone. What should you be doing before your trip? The first thing is CONTACT US. From experience understanding the environment you are about to go into helps. So it also helps to take smaller steps in getting to your ultimate goal. You can not jump in and run a Marathon without any preparation. Well, maybe you could but you will not enjoy it and get injured. You can afford this to happen miles away from help. We take on these journey’s and challenges to enjoy them, experience a new culture, learn about yourself and feel confident and ready to enjoy an amazing journey. Knowledge is power, so get informed about your trek, or climb is vital in the mental preparation. Personally, number 2 – 10 all help you mentally when preparing for number 1 on the list. Back in 2007 while preparing to climb Everest. We took on 4 mountains on 4 continents between June 2007 and June 2008 to build the Mt. Everest Primary school. In January 2008, two months before flying to Everest. 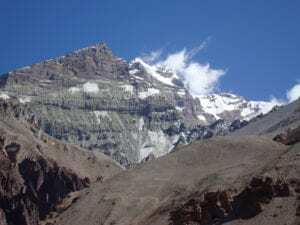 We successfully climbed the third mountain Aconcagua in South America. We were on the summit on day 12 as we were under time pressure with work. BIG MISTAKE!! I was slowly learning that I don’t acclimatize well to low oxygen environments. My resting heart rate was 38, I had been training 6 days a week for a year. I was able run the Spink 3 times in one day (9km trail in Wicklow, Ireland) I would hike for 8 hours with 25kg (55/60 pounds) backpack on a multi day basis and then back in the gym for 3 hours a day, day after day. Check out our Top Tip for Everest Base Camp Treks. I was in excellent physical shape and ready to go. Altitude was totally different element that needed careful consideration and preparation and we didn’t give lack of oxygen it’s due consideration. As people react differently to the lack of oxygen this should be one of the most important factors when considering trekking or climbing a mountain. I have climbed Kilimanjaro in 5, 6, 7 & 8 days and I can tell you the 7 & 8 day trips help me enjoy the mountain experience in a safe and responsible manor. Standing just below 23,000 ft on Aconcagua after 12 days is reckless, dangerous not only to ourselves but others on the mountain and not the right way to enjoy the journey and be responsible. So I struggled back down Aconcagua and the two professional cancelled our Everest climb in January 2008. They said I was not good enough for Everest. After a lot of reflection and time spent meticulously analyzing my experience at altitude to date and my preparation. I also had some key conversations with Graham my climbing partner. I came to the conclusion that I do not acclimatize well under a constricted time frame. I need more time to acclimatize to low levels of oxygen and I would have that additional time on Everest. I was so afraid of the lack of oxygen for years, I am afraid of heights. I needed to over come these issues. Only through struggle, concerns, failure we can pick ourselves up, evaluate and move forward stronger. That is what we did. All the mental challenges needed to be faced to prepare me mentally for the tasks, mountains and challenges ahead. We decided to find a new team to join. We did and went on to climb Everest, without a headache, altitude issues or any altitude related issues at all. Since then I have climbed over 17,000 feet over 40 times and always have an adequate acclimatization built into our trips. Getting back to the main issue. A lot of the physical preparation, training, camp craft, climbing ability, my gear, understanding my environment, hitting the wall, knowing how to camp in all types of weather and conditions. All this knowledge helped me mentally get over professionals telling me I wasn’t good enough for Everest and cancelling our trip. I was confident in my ability to climb, I was confident in my fitness and I had highlighted my weakness and addressed the issues. More time acclimatizing is the key to success. Good physical conditioning is also vital. What is more important is to get out, challenge yourself, make mistakes, but build gradually to the point you are ready and confident to move forward. I spent a lot of time visualizing standing at camp 1, camp 2, camp 3, camp 4 and on the summit of Everest. I had convinced my mind that I would complete this goal. Went I wasn’t training I was learning more about the mountains I wanted to climb, testing my gear, studying the mountain, mentally becoming more confident in my ability to achieve my ultimate goal. Knowledge is power and the more you have the more you can battle your mind against all the negative idea’s and emotions that pop into your head.